Here is a really cool and original concept. From a practical point of view it is kind of pointless but from an art point of view it is just clever and brilliant. It is really a nice work of art. Some would say that it is make them happy and the idea is sweet, others would say that it is a little bit creepy and sad. 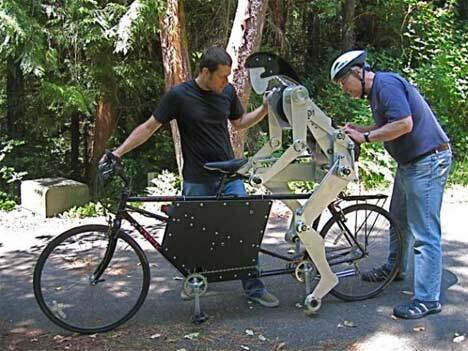 I'm taking about robot named Joule that powers a tandem bicycle from the back seat. It beautifully mimic the same motions as a human would do. The robot's creator, Carl, built it after he was challenged to create a tandem electric bike based on actual pedal pumping. The result is just a beautiful and quite impressive fluid and smooth machine, although it certainly not the easiest or the most efficient way (In fact, really far from being efficient) to make a tandem e-bike. This bike would be more convincing if Joule would take his training wheels off. The kiddie wheels prevent falling from people who can't balance themselves. Same here, Joule is make from a lot of heavy aluminum. 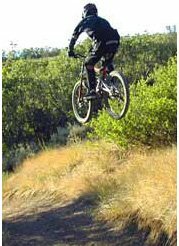 Therefore, the center of gravity of such machine is much higher and further back compared to regular two human tandem seater. It makes it impossible to balance the bike without the training wheels. The inventor could use much lighter carbon fiber composite material, or make some holes inside the aluminum to reduce the weight and hopefully get rid of the kiddie wheels.